Otto Bierbaum studied in Leipzig. He worked as a journalist and became the editor of several journals, among them "Pan" and "Die Insel". He wrote novels, poems and plays. His novel "Stilpe" (1897) was the inspiration for Ernst von Wolzogen's cabaret "Überbrettl". He was close to the secessionist painters in Munich and he wrote books about Böcklin and Stuck. Between 1891 and 1894 he published the "Moderne Musenalmanak". 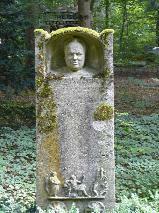 The grave of Otto Bierbaum at the Waldfriedhof in Munich.